The Swedish-born painter Widforss trained, as did many European artists, in a technical school – the Royal Technical Institute in Stockholm -- where he aspired to become a mural painter. He plied his trade for a number of years in Sweden. On his way to the Orient in 1920 he visited San Francisco and opted to remain in America. California provided him with many landscape subjects including the Monterey Coast, Santa Catalina and the southeastern deserts. His most frequent subject, however, was Yosemite. It was there that Stephen Mather, the first Director of the National Park Service, suggested Widforss focus on painting views of the national parks; “In 1923 he illustrated the book, ‘Songs of Yosemite’. In 1925, an agreement was struck between Widforss and Don Tresidder, president of the Yosemite Park and Curry Company, to provide room and board in exchange for a discounted rate on paintings. A collection of Widforss’s original Yosemite paintings now hangs in the lobby of the Ahwahnee.” (from www.yosemitegifts.com). Rafferty Ridge, the subject of this picture, borders Tuolumne Meadows in Yosemite National Park and is one of many views Widforss created of the park in 1922. Today, hiking trails go along it. Since snow still lingers on the peaks in this view it was probably painted in late spring or early summer. Widforss’s favorite medium was watercolor. 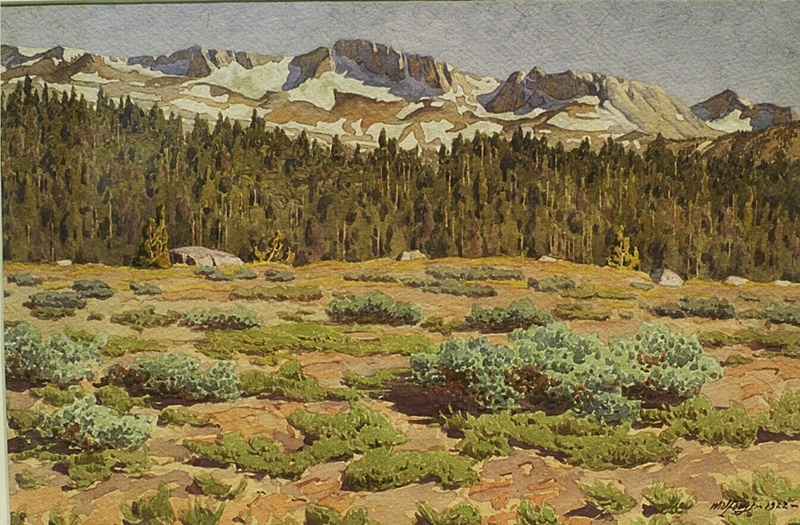 His style is more akin to the detailed historic English style rather than the bold brushwork of the California Watercolor style that evolved in the 1930s, and thus he gives an almost photographic rendering of the native sage in the foreground, the band of pines, and the background of the ridge through the clarity of sharp sunshine and shadow. Inscribed in pencil on reverse of paper "Rafferty Ridge", "Meadows and Mountains", "17th Wedding anniversary May 29, 1945","#17 IOT1110/55.00"; Provenance: Abells Auction, July 1987.